For you this DOOM Easter Egg is going to be the best yet if Hell Really Is Your Home, because someone has been really busy leaving cryptic satanic messages inside the game’s official soundtrack! For those of you who do not know, the official soundtrack of the game has been created by Mick Gordon, an Australian composer responsible for giving us the music we loved in first two seasons of Killer Instinct, Wolfenstein: The New Order, Wolfenstein: The Old Blood and now DOOM. Best DOOM Easter Egg Ever? We know that the whole going to hell to beat the demons concept has been well developed by id Software, but we had no idea that the people working on it would go to such lengths. 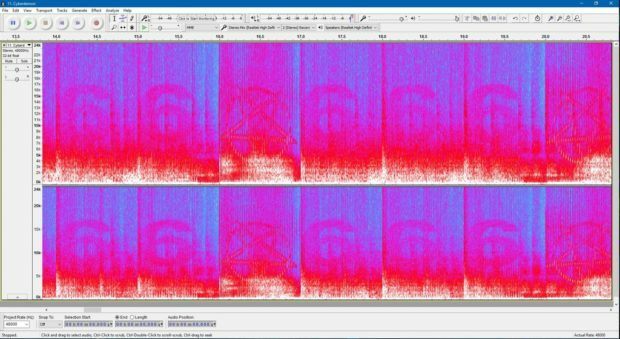 The satanic symbols have actually appeared on the official soundtrack when you view it using a spectrogram. You can see them in the image below. As you can see, there is the devil’s pentagram symbol taking up a major space. This symbol is directly related to satan. You can also see the number 666 repeating itself various times. Six hundred and sixty-six or the “number of the beast” is recognized in pop culture as the number of the antichrist or the devil himself. Whether you agree or not, Gordon is sitting somewhere in his crib right now content that his hard work has been recognized. We are pretty sure this is the most toilsome DOOM Easter Egg, and the most hard to find too! Did you see any other similar Easter Eggs in the game? Let us know if you did, we might actually cover the story on your tip!